Gibson endorsed international touring artist, Camille Bloom releases her 8th studio album, and 5th full length "Pieces of Me" on Sept. 9th 2016, after successfully raising $27,000 from fans around the world. 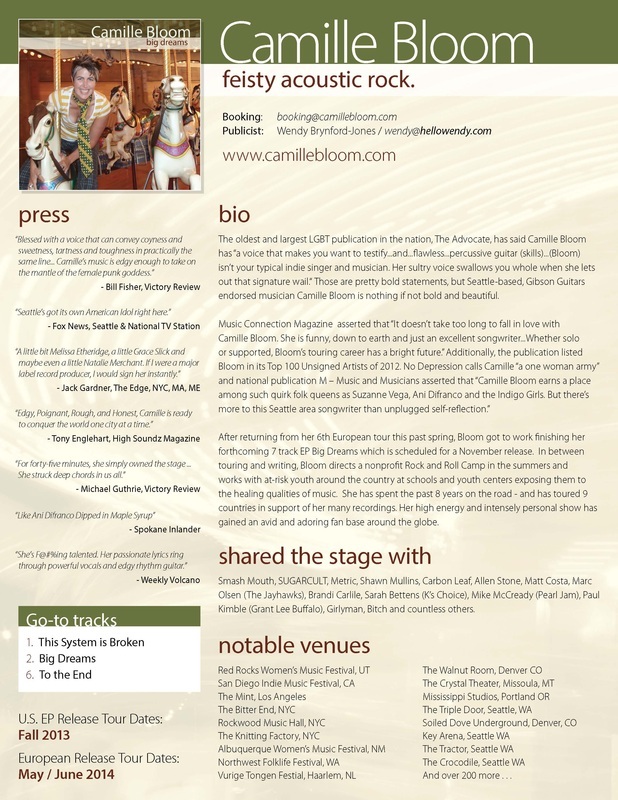 This album departs from Bloom’s history of working with well known producers such as Martin Feveyear (REM, Presidents of the United States) and Paul Kimble (Radiohead, David Gray) – and brings Camille to the forefront as not just a standout songwriter and captivating performer, but as a phenomenal producer. "This album encompasses all of the parts of me - the producer and the artist, the folker and the rocker, the balladeer and the brazen. I have always put my heart into my songs, but this time, my heart was in charge of how each song was presented. This is the most honest work I have ever put forth, even shining light on the variable nature of my songs– and it couldn’t have been accomplished without my fans, who helped me raise enough to build my own studio and put my work first. Ten years ago, after an investor coaxed her out of her teaching job with promises of financial support and seed money, Camille took a giant step onto the stage as a full time touring musician. It took Camille only a year to rack up 26K in credit card debt trying to support herself, but over the past 10 years, she has continued to build her audience one show at a time. In addition to playing shows, she also dedicated 10 summers to running Music camps for kids, and now runs songwriting retreats on her farm – where she will use the studio built this year, to record and produce up and coming young songwriters. Camille has spent the past 10 years touring the U.S. and Europe, and has gained notoriety in some of today's best publications including Performing Songwriter, M Music Mag, and No Depression who called Camille "a One Woman Army" Music Connection Magazine asserted "It doesn't take too long to fall in love with Camille Bloom. She is funny, down to earth and just an excellent songwriter . . . whether solo or supported, Bloom's touring career has a bright future." Additionally, the publication listed Bloom in its Top 100 Unsigned artists of 2012. Publication M-Music & Musicians asserted that "Camille Bloom earns a place among such quirk folk queens as Suzanne Vega, Ani Difranco and the Indigo Girls. But there's more to this Seattle area songwriter than unplugged self-reflection." She also placed on the European FAR (Freeform American Roots) Charts with Bob Dylan, Iron and Wine and Brandi Carlile. Camille has toured 9 different countries with her dynamic voice and edgy acoustic rock, and continues to play throughout Europe and the U.S. each year, including gigs at the most premiere venues around the globe: New York City's Bitter End, Boston's Club Passim, Seattle's Triple Door, Tractor, and Crocodile, Denver’s Soiled Dove, Los Angeles' The Mint and over 150 other rooms spanning the nation. She has shared the stage with Chris Isaak, Smashmouth, Metric, Carbon Leaf, Matt Costa, Brandi Carlile, Mike McCready (Pearl Jam) and many more. From the upbeat bluesy rocker “Hit the Road” to the Swinging Mandolin driven “Pieces of Me”, there is bound to be something on this album you will fall in love with. Camille will spend much of 2016 on the road supporting “Pieces of Me”. A little Ani Difranco and a little Jewel, SeattleÕs Camille Bloom sings, scats and serenades. Look out Seattle, we've got a rising star here! Camille Bloom's songs will capture you no matter what the age. Sultry yet powerful, Bloom's songs deliver enough energy to make even rain dance. Camille was playing solo, and for forty-five minutes she simply owned the stage. Members of the audience applauded the insights in her songs. She struck deep chords in us all, particularly when she sang about self-acceptance. Blessed with a voice that can convey coyness and sweetness, tartness and toughness in practically the same line…armed with a catalogue of emotionally rich songs…equipped with a strong, highly rhythmical guitar technique… Camille's music is edgy enough to take on the mantle of the female punk goddess. Camille Bloom captures my heart with her songs on her latest CD titled, "Your Only Warning". She's got stand out vocals, great guitar, just all around great tunes. I even catch myself singing along to several songs as I drive around town. That says a lot! Look out Seattle, we've got a rising star here. Music can be many things for people. Generally, it's an outlet for emotional release, whether it be anger, joy, desparation or fear; it is to each his - or her - own. For Camille Bloom, her new alterna-funk rock tunes weep in their reflections on longing, guilt, and the fear of something too good. In her latest song, "goodbye," the haunting melodies accent her thoughts of taking control over her own life and choosing to say "goodbye" to the inner demons that plague us all. She's F@#%ing talented. her passionate lyrics ring through powerful vocals and edgy rhythm guitar. "Sultry yet powerful, Camille's music can make even the rain dance." Laura T. Lynch | Kweevak Impressive! This thirteen-track collection features Camille on lead vocals and guitars as well as other proficient players on drums, bass and piano. Her musical style is acoustic based with an alternative edge and shades of folk and funk. Bloom writes hard-hitting lyrics about personal experiences and life. She sings with intensity and power yet her vocals are velvety and sweet, an intriguing combination. Camille's songs have memorable hooks, edgy guitar rhythms and plenty of innovations. 'Jimmy' is a poignant song about the death of a nineteen year old. Camille's vocals are rich and reflective on this acoustic tale. 'Painted on Smile' has a snappy beat an edgy hook and features commanding singing and lyrics. '17' is another catchy song with a strong beat, subtle acoustic tones and versatile vocals. Camille Blooms is off to a notable start with her first CD as Within Me is impressive! The extremely talented Camille Bloom combines passion and intellect in every song. What strikes me most about Camille Bloom is very powerhouse voice. It's very strong, yet has a soft, maybe even vulnerable quality.
" Say Goodbye to Pretty "
Camille Bloom’s sophomore release, “Say Goodbye to Pretty”, is a testament to Camille’s talent as a musician. Her voice ranges from powerful to sultry. Bloom is definitely hitting her stride as a musician. The lyrics and music stay with you long after the song has ended. This cd is a must have for the collection. "Seattle has it's own American Idol - Camille Bloom"